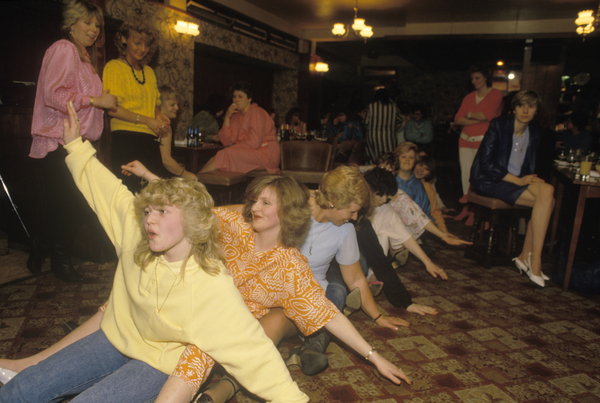 ‘Oops!’ (Rowing Boat Song), Hen Night, South London pub, circa 1980. © Homer Sykes/Photoshelter. I remember a dance where you all sat in a line on the floor with your legs astride the person in front and then swayed from side to side and stuff. What was that dance called and what song was it meant to go with? It was for ‘Oops Upside Your Head’ by the Gap Band…Sweet reminiscing of discos growing up! Did it have a name for the actual dance?! Assorted aunties used to refer to it as “that boat song…” Very popular with aged relatives for some reason, despite their assorted dodgy arthritis & rheumatism doing its best to hinder them. Yeah the row boat song. A classic at family dos the length and breadth of the country it was also hilariously lampooned on ‘Men Behaving Badly’ to ‘Sailing’ by Rod Stewart. Not sure of the name of the dance but the song was a group called Forest, I will find the title later, was played at a birthday evening or event. Great fun all innocent……fun. a. It’s a good track which fills the dancefloor. b. You get to look up women’s skirts as they get down (and up) – all innocent, though and I dare you to try to not look and see who’s wearing suspenders & who’s not. c. You usually gety some saddo walking up and down the line of “rowers” whipping them with his tie. Saw an interview on tv with the Gap Band and they said when they first came to England to do TOTP they couldn’t understand why everyone sat on the floor swaying from side to side. They’d never seen it done before. Must be an English eccentricity thing.